« Phnom Penh round two! From Phnom Penh, I took a flight to Kuala Lumpur then caught a connecting flight to Kota Bharu. As I got off the plane, Catherine, jumped out of no where to greeted me. I wasn’t sure if she’d be able to make it, so it was a pleasant surprise. Many Malaysians stared at us when we went to the night market. We were the only foreigners there. Malaysia has a lot of Muslims who wear the head dress and wear covering clothing or burkas. Catherine and I were covered up in pants and t-shirts, so we wouldn’t draw attention, but they still stare because they aren’t use to westerners. 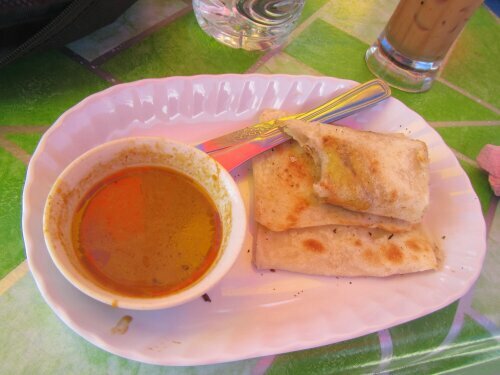 We got Roti Canai, which is like a tortilla/pancake, one with bananas and another with chicken. Both were delicious! This has become my favorite Malaysian dish especially with the curry sauce. 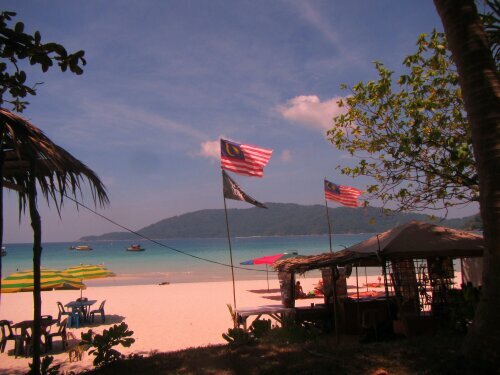 The next afternoon, we shared a taxi with a Canadian girl, whom we met at the hostel we stayed at, to the pier in Kuala Besut to take a speed boat to Long Beach on Pulau Kecil (the small Perhentian island). We were taxied in from our speed boat to the island. The beach is beautiful! Such bright blue water. 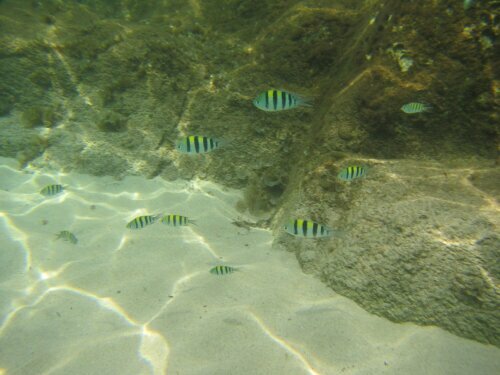 Even if you just walk out on the water you can spot several little fish. We decided to stay at Panorama because we heard good things about their PADI program (diving instruction) and they gave us a package deal with our room. We had 4 days of both theory and hands on instruction. First we had Wayne as our instructor then we had Jesse. Both were great instructors. 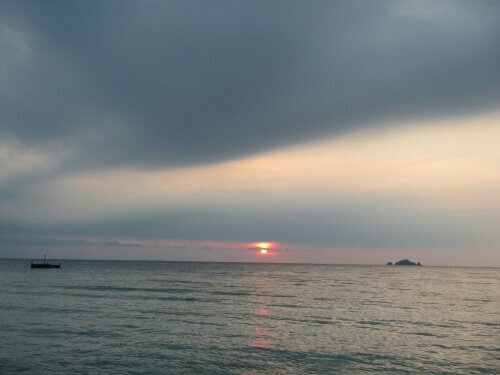 The first dive site was at 10m at Batunisan, which is right in front of Long Beach. We saw so many fish! Triggerfish, clown fish (nemo), snapper, longfin butterfish, parrot fish. There are no pictures because I didn’t want to have to fuss with my camera. I already had a bunch of other equipment to worry about, but that is OK because Jesse our instructor filmed our last two open water dives with his go pro. The second dive was at 11.2 meters and was at D’Lagoon which is a short boat ride away. There were way more fish and coral. The last two dives were about 18 meters. We saw all the same fish as before. No sharks, sting rays or turtles. Boo. But at least I am now certified and can dive anywhere in the world! 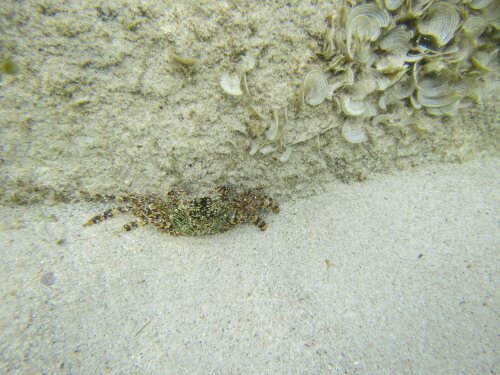 Plus, it was in those last dives I felt very comfortable under the water. Here are some links to the videos. I’m in pink and Catherine is in blue. 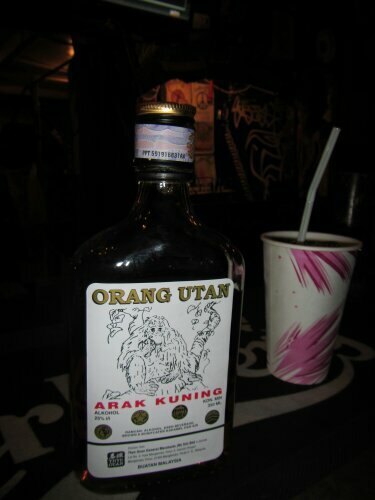 We celebrated our cert with a bottle of Orang Utan (money juice/Malaysian whiskey) with coke for 20 ringet, which is about $7 USD. It tastes like vanilla coke with a little kick. On the other side of the island is Coral Bay, which is a quick 5 minute walk. We swam out to a floating dock where it has a great view of the maze coral below. We swam back to shore to watch the sunset. 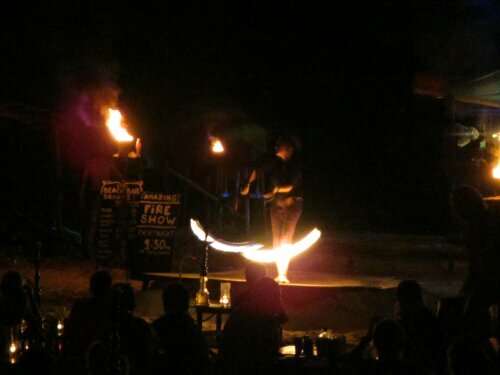 At night there’s a fire dance show. I’ve seen this before, but these people were tearing it up! Catherine and I swam almost every night and one night we watched the fire show while in the water. It was awesome! We were the only ones in the water and it cooled us down! Igbal and Amin, locals we met, were supposed to go on a hike to the windmill with us, but they were late, so Catherine and I decided to find it on our own. We just followed the power lines which was actually hard to find initially. At the top by the windmill there was an excellent view. Tons of swallows were flying around in the ocean wind. Next we hiked down to D’Lagoon which is a beach on the other side and only accessible by boat or by the hike. There was only a couple there, but other than that the beach was ours. I almost forgot to mention the animals I encountered. 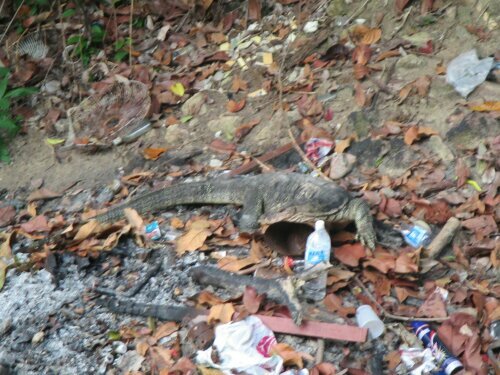 A giant fruit bat, a huge monitor lizard and a huge sea eagle. There was a giant fruit bat that would fly to and from a tree in front of where we stayed. It was about the size of a full size seagull. At first I thought it was a nocturnal bird, but then I saw the shape of the wings. It flew with perfect precision, definitely nothing like a small bat that flies sporadically in all directions. 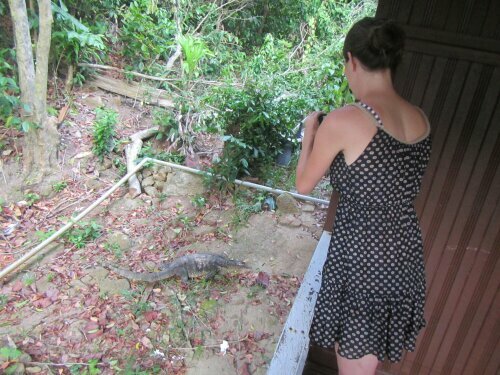 There was a monitor lizard that gave us a visit. I don’t have a picture of the sea eagle, but I witness it catch a fish from the ocean. At first u thought it was a big toy plane taking pictures of the ocean. It was massive! 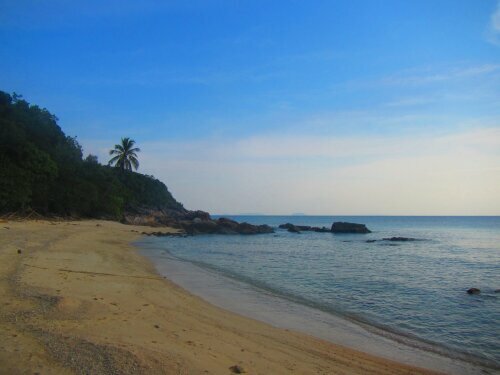 Off to Kota Bharu to catch a flight to Tawau so I can dive in one of the worlds best diving spots, Sipadan. 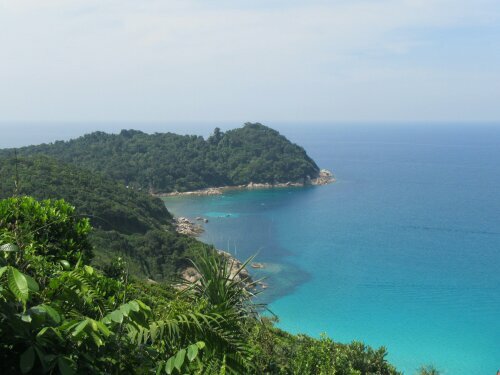 This Post was posted in Malaysia, World Trip 2013. Bookmark the permalink. 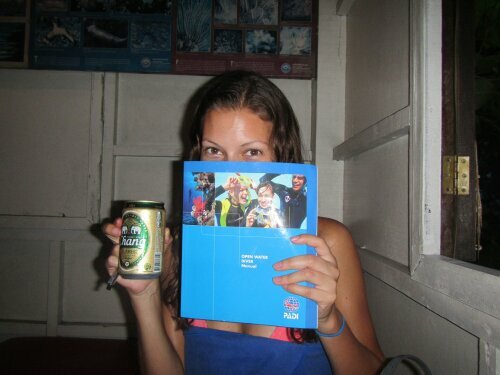 you are a certified diver, that’s awesome! 😀 just open water. Thinking about an advance cert so I can dive deeper. not necessary, once you are comfortable, going deep isn’t that big of a deal. I love diving!